The Acura NSX prototype will break cover tomorrow at Mid-Ohio and Acura has teased us with a new video ahead of its debut. 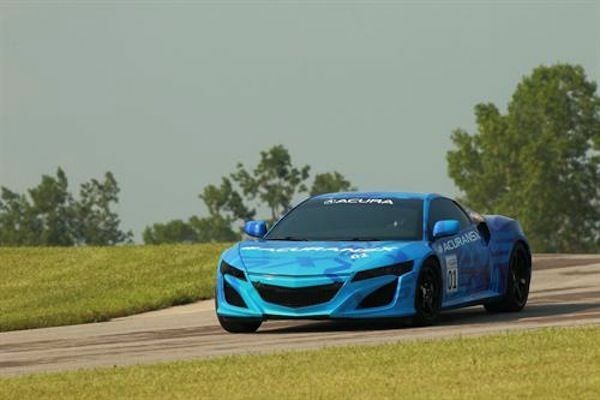 The prototype is a forerunner of the new 2015 Acura NSX that will be built here in the U.S.
Acura will build their new 2015 NSX supercar right here in the U.S. and has teased us with a new video ahead of its debut at Mid-Ohio. The new hybrid supercar will be produced at the newly established Performance Manufacturing Center in Marysville, Ohio. The mid-engined NSX hybrid prototype will take to the racetrack just prior to the Honda Indy 200 IndyCar Series race at Mid-Ohio Sports Car Course in Lexington, Ohio tomorrow. The new Acura NSX will be built in the U.S. but will be launched in 2015 as a global supercar. Production and design of the next-generation supercar is being led by engineers at Honda R&D Americas, Inc. in Raymond, Ohio. The new NSX will have a price tag between $85,000-$115,000 USD when it reaches production. Before its launch, Acura will bring an NSX prototype model with custom graphics and will lap the road course in advance of the race tomorrow, Aug 4. The race will be broadcast live by NBC Sports Network starting at 3 p.m. EDT. The NSX prototype Acura teased in the videos below maintains the styling and proportions of the NSX Concept that debuted at the North American International Auto Show in Detroit in January 2012. The supercar will feature a mid-mounted V6 engine mated to Acura's innovative new three-motor Sport Hybrid SH-AWD (Super Handling All Wheel Drive) system. This will allow the new supercar to handle well in wet or dry conditions as the video below shows the NSX prototype getting sideways on a wet track surface. Honda is showing the world it can build a supercar that will rival the likes of the new Porsche 918 that features superb performance along with new hybrid technology. The new 2015 NSX production sports car will help Honda’s image globally as they attempt to compete with the Germans. Watch the new Acura NSX prototype videos below as the Japanese automaker teases us ahead of its debut to build excitment for the next-generation 2015 Acura NSX. It should be a fun lap tomorrow at Mid-Ohio wet or dry. Watch New Acura NSX Prototype- 2013 and Wet Track teaser videos.